We were not disappointed. We started the day with a three hour lecture at the lodge. Denny Rickards greatest contribution to stillwater flyfishing, in my opinion, is his emphasis on the usage of an intermediate sly-line. He claims to use it in over 90% of situations. 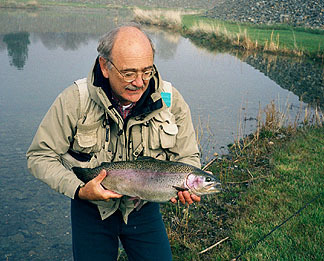 He claims to have spent over 20 years developing his system at Klamath Lakes, and it shows. He spoke with convinction. At the conclusion every member who didn't have one chose to purchase the intermediate line he recommended. "Why, these look like golf course ponds"
Indeed they do. The ponds are not in a particularly beautiful setting, but we came here for the big fish and that's what we got. I managed to sneak in a couple of hours of fishing prior to the lecture (I learned this trick from last year's clinic) and ended up with the biggest trout of my life (excluding steelhead), about a 6 pounder. The top picture shows the fish. But I knew the best was still to come. 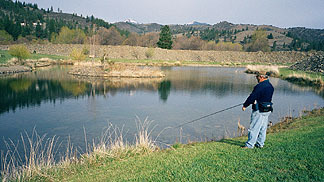 The north pond was the most demanding and had the biggest rainbows on the ranch. We fished it in the evening and I hooked 2 fish over ten pounds. The first was hooked in about 2 feet of water and he snapped the tippet during the take. The second big fish was caught at dusk. I tussled with him for quite some time until Tom Kilfoil came over with the landing net and helped revive the fish. The bottom photo shows that fish. As I understand it, everyone in our group either landed or lost fish over five pounds. Several members caught a number of trout of that size. The ponds varied in difficulty and there seemed to be a pond for every skill level. The Denny Rickards series of clinics held at trophy lakes around the West is a great way to improve your stillwater skills. He has a lot to offer even if you don't completely buy into his system. Most of us will tailor his system according to our experiences. 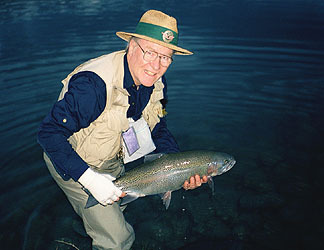 Tom Kilfoil used his newly acquired skills at McCumber Lake, on the way home, and caught 15 trout up to 16 inches. My biggest reservation with the Rickards system has to do with the concept that you only need 5 patterns to deal with all stillwater situations. It reminded me of a similar attempt I made years ago. I had just graduated from high school and was free of my mother's cooking for the first time. I decided to create the perfect breakfast. For a number of weeks I made every breakfast imaginable. First day it was milk and doughnuts. The next day it was Quaker Oats with banana slices and sugar. After exhaustive research I concluded that the ideal breakfast for me was pork sausages, 2 eggs fried sunny side up, and hash browns with coffee. I then proceeded to eat this perfect meal every single morning. Well, you guessed it. After about six weeks I couldn't stand the sight of this food combination. Frankly, now that I have told you this experience, I can't see how it relates to having 5 universal flies.